The average cost of memory care in Fayetteville is $5,300 per month. This is higher than the national median of $4,650. Cheaper nearby regions include Rogers with an average starting cost of $5,281. To help you with your search, browse the 7 reviews below for memory care facilities in Fayetteville. On average, consumers rate memory care in Fayetteville 4.1 out of 5 stars. Better rated regions include Rogers with an average rating of 4.7 out of 5 stars. The city of Fayetteville is situated at the foothills of the Ozark Mountains and is home to more than 85,000 people. While this city is best known as a college town and has a younger population, seniors, who are at an increased risk for Alzheimer's, comprise about 9 percent of the population. In the whole state, it's estimated that 56,000 people are currently living with Alzheimer's disease. Memory care facilities are officially referred to as Alzheimer's special care units. These facilities are located within long-term care facilities, including both nursing homes and assisted living facilities, and specialize in serving residents with Alzheimer's and other forms of dementia. 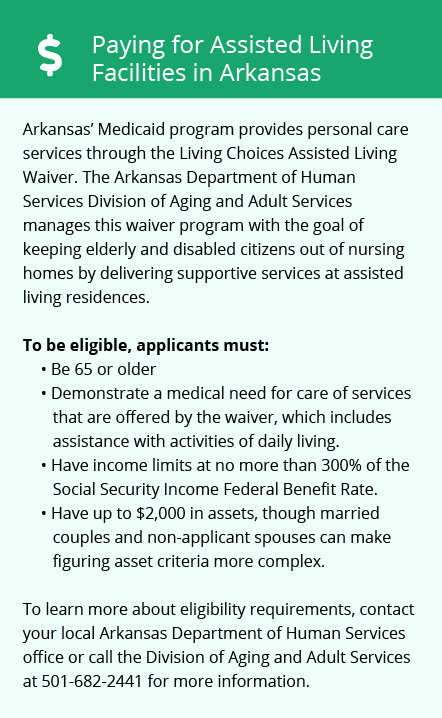 ASCUs are licensed and regulated by the Arkansas Department of Human Services. Fayetteville has one memory care facility for local families to choose from and five more in the surrounding region. In Arkansas, Social Security benefits are not taxed, and other types of retirement income are partially taxed. This may affect Fayetteville seniors' memory care budget. The overall cost of living in Fayetteville is slightly lower than that of the nation as a whole, and healthcare costs are about 13 percent below the national median. This may make the city a good option for families with a tight memory care budget. Seasonal temperatures in Fayetteville may be extreme, with summer highs near 90 and winter lows in the 20s. In spite of cold temperatures, the city only receives about 6 inches of annual snowfall, which may appeal to families who drive locally to visit their loved one in a Fayetteville memory care facility. The air quality in Fayetteville is outstanding, which may be beneficial for seniors with cardiovascular or respiratory conditions. The American Lung Association gave the county As for both short-term particle pollution and ozone pollution. Memory Care costs in Fayetteville start around $5,300 per month on average, while the nationwide average cost of memory care is $4,799 per month. To see a list of free memory care resources in Fayetteville, please visit our Assisted Living in Arkansas page. 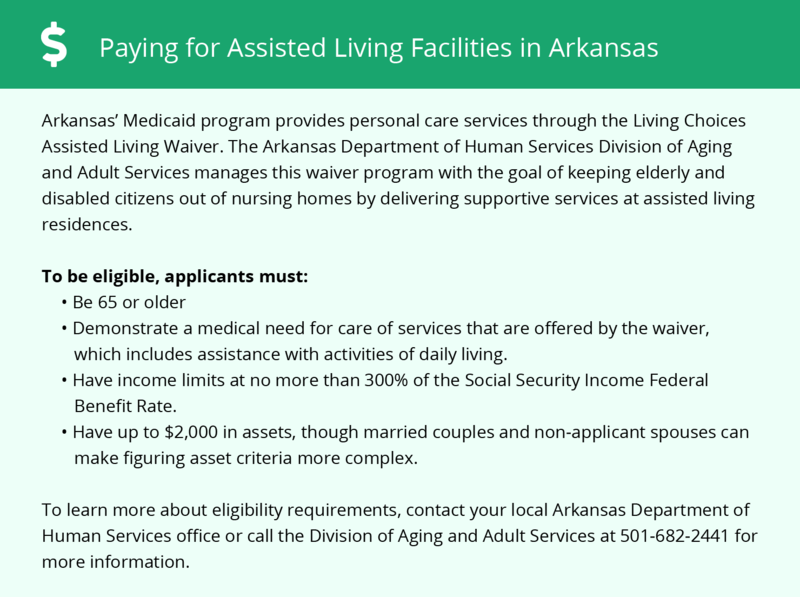 Fayetteville-area assisted living communities must adhere to the comprehensive set of state laws and regulations that all assisted living communities in Arkansas are required to follow. Visit our Memory Care in Arkansas page for more information about these laws.